Alex Malenki interviewing “Shlomo Finkelstein”, who faces up to 5 years in prison for cirticizing Islam. His channel became one of the most successful conservative YouTube channels in Germany, with 80.000 subscribers at its peak. When a few far-right crazies started following his videos, he adopted the faux-Jewish moniker of “Shlomo Finkelstein” and an avatar of himself as a hook-nosed Jew with a rat’s body as a way of trolling actual Nazis. Shlomo also attracted the attention of leftist “hate speech” watchdogs, who started reporting his videos and getting his channels banned. He has had around 30 different YouTube channels over the past four years. Currently no official channel is active. However, his fans started downloading and mirroring his videos, which would often be banned by YouTube within minutes of going online. Currently the only official channel he has to watch his videos – well worth it if you speak German – is on SteemIt. In one of his videos, Shlomo revealed that this was a coordinated attack by left-wing trolls as part of the campaign “Reconquista Internet”, which is allied with the taxpayer-funded “No Hate Speech” movement. In a formal inquiry, AfD MP Petr Bystron put the Merkel government on the spot over the trolling of the victim’s grieving mother, but the government denied all responsibility. Shlomo has had to hide his identity for four years now. Left-wing thought police started closing in on him in January, after a fan calling himself “0rbit” began doxxing politicians and left-wing celebs on Twitter, including many of Shlomo’s favorite enemies. “0rbit”, whose real name is Johannes S., was a fan of Shlomo’s and used the same admin for internet services. This admin, named Jan Schürlein, turned state’s evidence and apparently provided information on Shlomo himself. 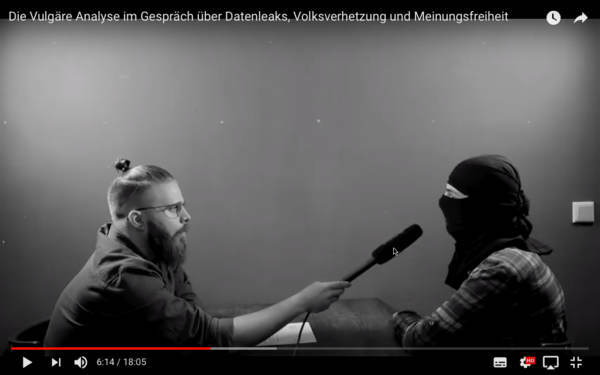 In January, reporters from left-wing Spiegel magazine (still reeling from its latest Fake News scandal) showed up on the doorstep of someone they claim is Shlomo Finkelstein. Soros-funded “hate watchdog” Amadeu Antonio Foundation, which is run by ex-Communist Stasi agent Anetta Kahane, even went so far as to publish what they claim is Shlomo’s real name and address on their website Belltower.news. It is unclear how the left-wing foundation obtained this internal information from the police investigation. AfD MP Petr Bystron said he would do whatever he can to help the young man. “We need to stop all government funding for the Amadeu Antonio Foundation, whose sole purpose is to attack and doxx people who have the wrong opinion,” Bystron said. In January a freelance employee of the Amadeu Antonio Foundation was arrested in Berlin for torching the car of an AfD member, Gateway Pundit reported. You can donate to Shlomo Finkelstein’s defense via Bitcoin here. UPDATE— We were able to contact “Shlomo Finkelstein”, who is in hiding, and he confirmed the “hatespeech watchdogs” doxxed the wrong person. He is not in immediate danger. He is awaiting official charges from the prosecutor.